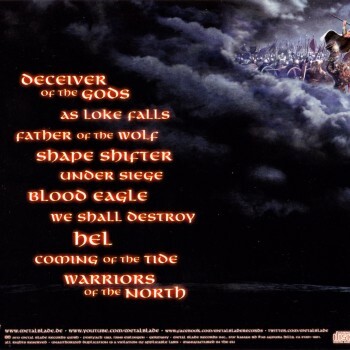 Akhirnya Materi paling Fresh milik Viking Melodic Death Metal Populer asal Stockholm Swedia yang eksis sejak 1992 ini termuncratkan juga setelah gw cukup terpukau dengan track " Deceiver of the Gods " yang mereka Luncurkan lebih dulu sebagai Single Pertama album full ke 9 mereka ini masih bareng Metal Blade Records, adalah Track Fantastic dengan gaya Khas melodius Amon Amarth cukup bikin gw interest Menunggu Full album " Deceiver of the Gods ". Amon Amarth is, and has been, undoubtedly one of the iconic Melodeath bands, the band has pioneered the use of their lyrical theme; they’re one of the first bands to write lyrics that revolve around the Norse mythology (having been preceded by Bathory). The guys deserve credit for converting many metal fans to die-hard melodic death-metal fans. secara resmi dilempar di kepasaran pada 24 Juni untuk Eropa dan 25 Juni untuk Amerika. selain tersedia dalam format CD, Pihak label juga merilis dalam Jewelcase CD, 2 CD digipak, Boxset includes, Picture LP dan LP yang versi 500 Kopi warna Biru dilisensi ke Nuclear Blast Records. 10 lagu Fresh Melodic Death Metal ini dikerjakan di Backstage Studios di Derbyshire, U.K untuk pertama kalinya bersama Produser dan Enjiner terkenal Andy Sneap yang sudah mengantar sukses album2 band top seperti Arch Enemy, Accept, As I Lay Dying, Benediction, Caliban, Cradle of Filth, Chimaira, DevilDriver, Dimmu Borgir, Exodus, Killswitch Engage, Kreator, Lock Up, Machine Head, Megadeth, Napalm Death, Testament dan masih banyak sekali hasil tangan dinginnya sukses dipasaran. menambah poin plus untuk kredit album ini, Amon Amarth berharap sekali album ke-9 ini bakalan sukses ditangannya. an album that sadly remains much underappreciated among fans due to its admittedly simple, yet in my opinion, amazingly catchy compositions. When it came out I thought it was their strongest offering so far, well balanced and with zero point zero filler tracks. However, even though I was confident the Vikings would release a worthy successor, I didn’t expect it to blow away the preceding album like dust upon a sleeve. Masih tangguh dengan Konsep dan Skill yang mengedepankan elemen melodius-nya, Amon Amarth masih untuk kesekian kalinya eksis dengan konsep musik sejak materi album awal. This is pretty much the most cookie-cutter modern metal you can ask for, with little that is creative or interesting about it. The lyrics are pretty simple Viking gimmick-stuff and are delivered by the rather restrained and bland growls of Johan Hegg, worshiped the world over for reasons I’ll never get. He doesn’t have a bad voice but he just never lets loose and really puts his whole self into the performance, making it sound like he’s just restraining himself so as to not scare anyone. He’s very listenable in general, but why bother having harsh vocals if you’re going to do it so tamely and unimpressively? I think this stuff would work just fine with clean vocals. It’s not like this is really that extreme or anything, and the growls are just boring as it is. " 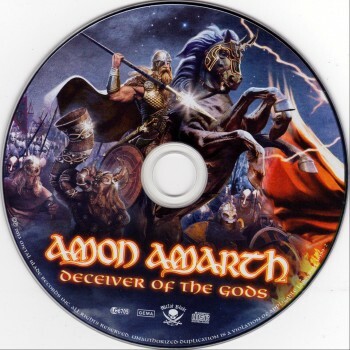 Deceiver of the Gods " masih menjadi andalan Kuat di album ini sehingga pantas memang dipajang di urutan terdepan Album ini, bagaimana Amon Amarth masih memukau dengan gaya Catchy headbang nang Melodius itu. beberapa sentuhan klasik Heavy Metal melodius ala Iron Maiden serta gaya Power metal yang begitu kuat masih menjadi elemen kuat pada struktur bermusiknya. dan tentunya masih membawa Aroma fresh album sebelumnya era " Surtur Rising " atau " Twilight of the Thunder God ", namun bagi Gw ga ada yang banyak berubah dengan konsep band sendiri. Gw suka track ini saat memasuki part Refrain " Asgard's always been my home / But I'm of different blood / I will / overthrow their throne / Deceiver of the gods " Middle Screamin Vokalis Johan Hegg seperti menyatu dan meresapi feel -nya, dan beberapa part Thrash Ryhtym-nya Johan Söderberg memang mantap mengiring beberapa solo Gitar Olavi Mikkonen. memang menjadi sesuatu yang teramat sulit bagi seorang musisi untuk menciptakan pembawaan lagu dengan lirik yang begitu menyatu sehingga menjadi komposisi yang " Masuk " banget feel-nya. " As Loke Falls " masih tetap terus duet gitarus Olavi dan Johan kerja keras menciptakan Melodic Riffing yang mendayu dayu menjadi Bius yang mematikan dari para Kesatria Viking ini. mungkin juga banyak yang mengenal jika Karakter Musikal Amon Amarth ini adalah perpanjangan gaya lama " Heartwork " nya Carcass hingga Gaya lama In Flames masih dengan Gothenburg sound sebagai sajian tak terpisahkan. The music itself is also very tame, with mostly midpaced songs that occasionally lapse into ‘fast’ sections, though never anything truly unhinged or passionate-sounding like they actually give a crap about the music they're playing. The songs are all well written and contain some decent riffs and melodies, but none of them ever break out of the stodgy and unimpressive restraint they have going. There’s very little, if any, atmosphere on this, and that’s largely due to the dry production job, but the rather redundant songwriting also plays a part. The riffs are tightly played, but they're also pretty unexciting on the whole. " As Loke Falls " probably have the highest quotient of riffs that didn't bore me, but even those are only decent, not really any more than that. lalu " Father of the Wolf " sentuhan hangat Gaya Heavy dan Power metal padat masih menjadi komposisi yang mengalir deras dalam setiap aransemennya. begitu juga dengan " Shape Shifter ", " Under Siege " yang Melodius sekali sejak track awal, dan " We Shall Destroy " semakin mantap terus mengajak kita untuk Headbang dan headbang !! menjadi yang lebih Fresh lagi pada track " Hel ", Vokalis Messiah Marcolin ( nama aslinya " Bror Jan Alfredo Marcolin " ) ikut bernyanyi ditrack keren ini, selain menikmati gaya Rythym yang Headbanging abis, kita akan merasakan gaya agak2 Power dan Soprano vokal Messiah Marcolin menjadi bagian " Hidup " track ini terdengar Epic sekali ! Messiah Marcolin tentunya sudah ga asing lagi jika kalian pernah mendengarkan lagu2nya Candlemass, Colossus, Memento Mori, Mercy hingga Requiem adalah Penampilan sebelumnya selain sebagai seorang Komedian di Mini TV seri di Swedia " V som i viking " tahun 1991 lalu. 10 lagu berdurasi 47:52 ini masih menjadi teman yang asyik kala sore menjelang dengan segelas Teh Panas dan sebungkus rokok Mild hehehe ... spesial banget buat kalian fans gitar musik melodius yang berceceran mendominasi hampir semua part musik. apalagi sajian tema lagu tentang Mitologi Bangsa Viking menjadi pelengkap karakteristik band sudah sejak awal band ini terbentuk. Everything about this just sounds so small and average. I'm not asking for ornate prog-isms and complex songwriting, but With Deceiver of the Gods just sounds meager. The songs' scope is small, the melodies are small, the riffs are small, the vocals are small. Nothing here aspires to greater heights; it is all very by-the-numbers and stale. The songwriting does not inspire me to bang my head or sing along, which is what it was going for, so I guess that makes it kind of a failure to me. The band seems very much content to just keep marching along and achieving only the barest minimum of quality possible, which isn't a good thing. They never do anything wrong on this, but very little right, either, and mostly I was just bored as hell listening to this. Amon Amarth have a lot of fans, and I'm sure no matter what I say, those fans won't be deterred, but me, this isn't my kind of thing, and I find it too unimaginative and uncreative to really get into. This album is great because it appeals to basically anyone, including those who have never heard of death metal. If you haven’t heard of Amon Amarth yet this is the ideal album to start with, and if you have you probably already own a copy. Fresh material eventually owned most Melodic Death Metal Viking origins Popular Stockholm Sweden that existed in 1992, after gw termuncratkan also quite impressed with the track "Deceiver of the Gods" that their Launches as First Single first full album to 9 they are still with Metal Blade Records, is a Fantastic Track melodic style typical Amon Amarth enough interest to make gw Waiting Full album "Deceiver of the Gods". Amon Amarth is, and has been, Undoubtedly one of the iconic Melodeath bands, the band has pioneered the use of their lyrical theme; they're one of the first bands to write lyrics that revolve around the Norse mythology (having been preceded by Bathory ). The guys deserve credit for converting many metal fans to die-hard melodic death-metal fans. officially thrown in to the market on June 24 and June 25 for Europe to America. than is available in CD format, Party Jewelcase label also released in CD, 2 CD digipak, includes boxset, LP and Picture LP 500 Coffee Blue color version licensed to Nuclear Blast Records. 10 Fresh Melodic Death Metal song was performed at Backstage Studios in Derbyshire, UK for the first time with renowned Producer and Engineer Andy Sneap who has led successful album2 top bands like Arch Enemy, Accept, As I Lay Dying, Benediction, Caliban, Cradle of Filth , Chimaira, DevilDriver, Dimmu Borgir, Exodus, Killswitch Engage, Kreator, Lock Up, Machine Head, Megadeth, Napalm Death, Testament, and still a lot of success in the market results of cold hands. add plus points to the credit of this album, Amon Amarth hope all 9th ? ?album is going to hit his hand. an album that sadly remains much underappreciated among fans due to its simple Admittedly, yet in my opinion, amazingly catchy Compositions. When it came out I thought it was their strongest offering so far, well balanced and with zero point zero filler tracks. However, even though I was confident the Vikings would release a worthy successor, I did not expect it to blow away the dust upon the preceding album like a sleeve. Still tough with Concept and Skill that puts its melodic elements, Amon Amarth still exist for the umpteenth time with the concept of music since the beginning of the album material. This is pretty much the most cookie-cutter modern metal you can ask for, with little that is creative or interesting about it. The lyrics are pretty simple-Viking gimmick stuff and are delivered by the rather restrained and bland growls of Johan Hegg, worshiped the world over for but could be better I'll never get. He does not have a bad voice but he just never lets loose and really puts his whole self into the performance, making it sound like he's just restraining himself so as to not scare anyone. He's very listenable in general, but why bother having harsh vocals if you're going to do it so tamely and unimpressively? I think this stuff would work just fine with clean vocals. It's not like this is really that extreme or anything, and the growls are just boring as it is. 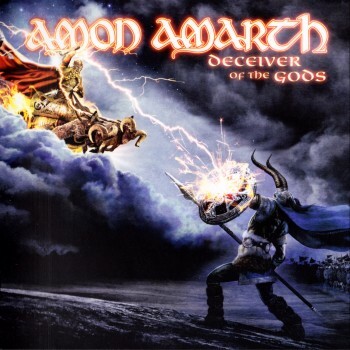 "Deceiver of the Gods" is still a mainstay Strong in this album so it deserves is displayed in the forefront of this album, how Amon Amarth still amaze with headbang nang Catchy melodic style it. a touch of classic Heavy Metal Iron Maiden's melodic style and the style is so strong Power metal is still a strong element in the musical structure. and of course it still brings fresh scent of the previous era album "Surtur Rising" or "Twilight of the Thunder God", but for Gw ga there are a lot of changes with the concept of the band itself. I like this track while entering the part Refrain "Asgard's always been my home / But I'm of different blood / I will / overthrow their throne / Deceiver of the gods" Screamin Middle Vocalist Johan Hegg as fused and impregnating her feel, and some Thrash her part Ryhtym Johan Söderberg was steady mengiring some solo guitar Olavi Mikkonen. indeed be something very difficult for a musician to create a song with lyrics that nature is so fused that into the composition of the "Log" really feel it. "As Loke Falls" still continues duet gitarus Olavi and Johan Melodic riffing hard work creating the mendayu dayu a deadly anesthetic from the Viking Warriors. may also plenty who know if this character Amon Amarth musical style is an extension of the old "Heartwork" by Carcass his old style with In Flames still Gothenburg sound as an integral dish. The music itself is also very tame, with mostly midpaced songs that occasionally lapse into 'fast' sections, though never anything truly passionate-sounding unhinged or like they actually give a crap about the music they're playing. The songs are all well written and contain a some decent riffs and melodies, but none of them ever break out of the stodgy and unimpressive restraint they have going. There's very little, if any, atmosphere on this, and that's largely due to the dry production job, but the rather redundant songwriting also plays a part. The riffs are tightly played, but they're also pretty unexciting on the whole. 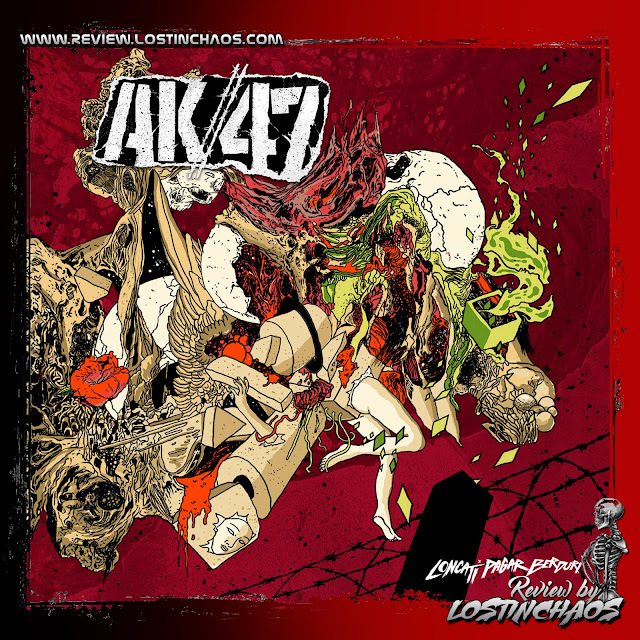 "As Loke Falls" probably have the highest quotient of riffs that did not bore me, but even those are only decent, not really any more than that. and "Father of the Wolf" warm touch of style Heavy and Power is still a solid metal composition flowing in any arrangements. as well as the "Shape Shifter", "Under Siege" is melodic track once since the beginning, and "We Shall Destroy" continues to bring us more determined to Headbang and headbang!! become more Fresh again on track "Hel", vocalist Messiah Marcolin (real name "Alfredo Marcolin January Bror") ditrack sing this cool, besides enjoying the style Rythym Headbanging abis, we will feel the force agak2 Power and Soprano vocal Messiah Marcolin be the "Life" this track sounds so Epic! Messiah Marcolin ga course, already familiar if you've ever listened to lagu2nya Candlemass, Colossus, Memento Mori, Requiem is a Mercy to look earlier than as a comedian in the TV mini series in Sweden "V som i viking" 1991 years ago. 47:52 10 song length is still a friend a fun time with a late afternoon glass of hot tea and a pack of cigarettes Mild hehehe ... really special for you fans scattered melodic guitar music dominates almost all parts of music. theme song let alone presentation on Viking mythology to complement the characteristics of the band has been since the beginning of the band was formed. Everything about this just sounds so small and average. I'm not asking for ornate prog-isms and complex songwriting, but With Deceiver of the Gods just sounds meager. The songs' scope is small, the melodies are small, the riffs are small, the vocals are small. Nothing here aspires to greater heights; it is all very by-the-numbers and stale. The songwriting does not inspire me to bang my head or sing along, roomates is what it was going for, so I guess that makes it kind of a failure to me. The band seems very much content to just keep marching along and Achieving only the barest minimum of quality possible, roomates is not a good thing. They never do anything wrong on this, but very little right, either, and mostly I was just bored as hell listening to this. Amon Amarth have a lot of fans, and I'm sure no matter what I say, those fans will not be deterred, but me, this is not my kind of thing, and I find it too unimaginative and uncreative to really get into. This album is great Because it appeals to basically anyone, Including those who have never heard of death metal. If you have not heard of Amon Amarth yet this is the ideal album to start with, and if you have you probably already own a copy.